Matthews – probably inadvertently – illustrated how Reagan, unlike the current occupant of the White House, understood his role as leader of the free world under threat from evil forces. What can we think of a regime that so broadly trumpets its vision of peace and global disarmament and yet so callously and quickly commits a terrorist act to sacrifice the lives of innocent human beings? What can be said about Soviet credibility when they so flagrantly lie about such a heinous act? 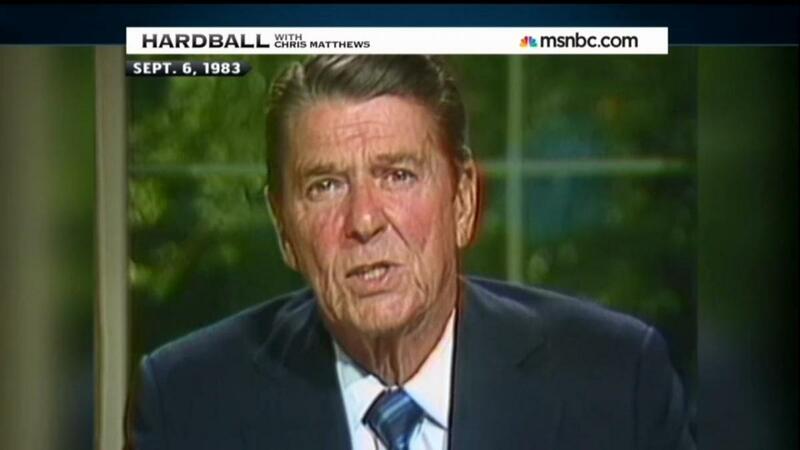 CHRIS MATTHEWS: Let me finish tonight with a flashback. From the moment I heard about today’s shooting down of a Malaysian airliner over Ukraine, I remember that 1983 shooting down of a Korean airliner over Soviet airspace. Back then, the Soviets, still in a Cold War mindset, refused to even admit responsibility for the deliberate murder of 269 passengers, including U.S. Congressman Lawrence McDonald of Georgia who was aboard. 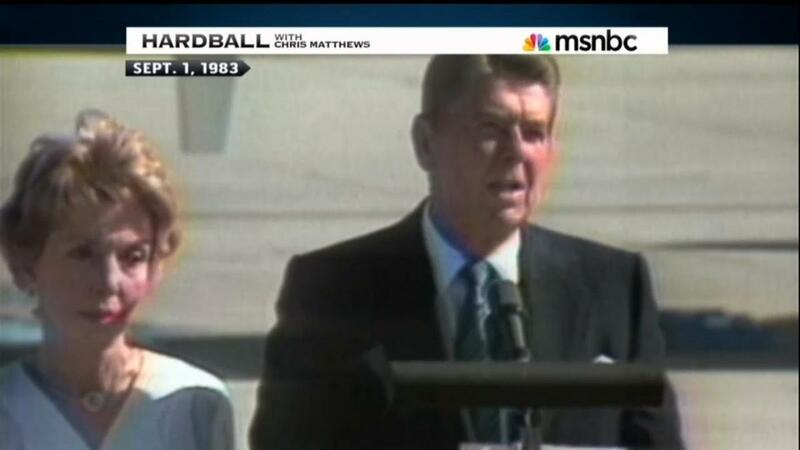 Here’s how President Reagan reacted. PRESIDENT REAGAN, SEPTEMBER 2, 1983 (at Point Mugu Naval Air Station): What can we think of a regime that so broadly trumpets its vision of peace and global disarmament and yet so callously and quickly commits a terrorist act to sacrifice the lives of innocent human beings? What can be said about Soviet credibility when they so flagrantly lie about such a heinous act? MATTHEWS: I can tell you, he was speaking for the American people back then who were absolutely furious at what the Soviets had done. Their cold-blooded killing of so many innocent people, their brutal destruction of so many human lives, their utter lack of compassion for the people aboard that plane. And here’s the way our President and we, the American people, felt. PRESIDENT REAGAN, SEPTEMBER 6, 1983 (at the White House): We know it will be hard to make a nation that rules its own people through force to cease using force against the rest of the world. But we must try. This is not a role we sought. We preach no manifest destiny. But like Americans who began this country and brought forth this last best hope of mankind, history has asked much of the Americans of our own time, much we have already given, much more we must be prepared to give. MATTHEWS: There are events like this today that no one forgets. Especially not today.